For those who like multiple levels of idiocy, this Gallery entry is for you. First we have the obvious misuse of quotation marks, a perfect image for the Don't "Quote" Me on That special section. 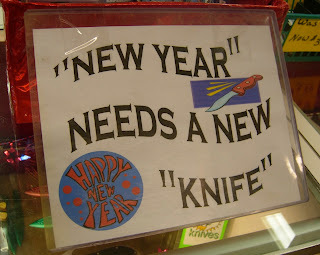 Then there's the whole questionable relationship between knives and the new year. What the hell does this sign mean? Is there a message on lower frequencies that I'm not hearing? Should I be scared?